a little top i made her from an ottobre pattern. i cheated and used the front of a country road shirt i picked up at the lancefield op shop that morning so it has these lovely pintucks and i didn't have to do extra hemming plus buttons! two little skirts using a basic skirt shape from ottobre (the pattern in the book had extra bits and embellishment that i didn't use). these were so simple and fun to make, i foresee LOTS of skirts in mae's future. a reversible pinafore made of lecien cotton/linen with vintage floral trim and pale blue/grey polka dotted cotton on reverse. pattern from this japanese craft book, borrowed from ellen. 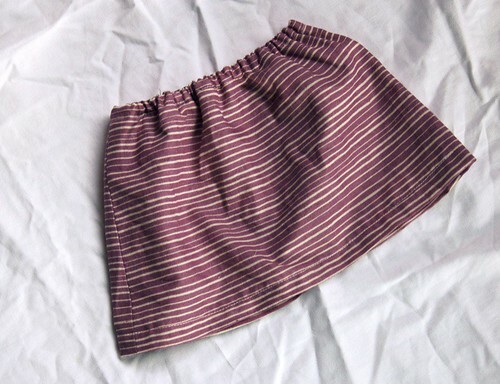 and a pair of jersey pj pants and some super cute bloomers that i haven't had a chance to photograph yet. i love this clothes sewing thing. it's been a goal of mine for so long now, seriously YEARS, and it's completely satisfying to finally feel like i can make things that are tidy, pretty and actually fit. i also finished off a new quilt for our couch to sit on and under. this one has been planned for months now and, after about 8 - 10 hours of quilting, i was supremely happy to sew the binding on and then throw it into the washer and dryer when i got home. it was hard to photograph but hopefully you can see the good randomness of it. 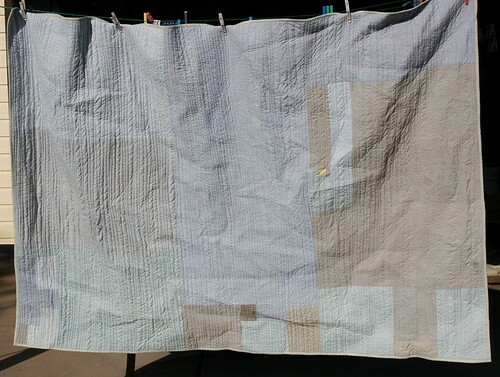 i used a bunch of cotton and linen that i had dyed grey and blue a couple of years ago and added the odd accent cotton pattern and a bit of linen that i gocco printed ages ago. Isn't ottobre fantastic!? So long as you remember to add seams in. Love the skirts and tunic! So pretty! 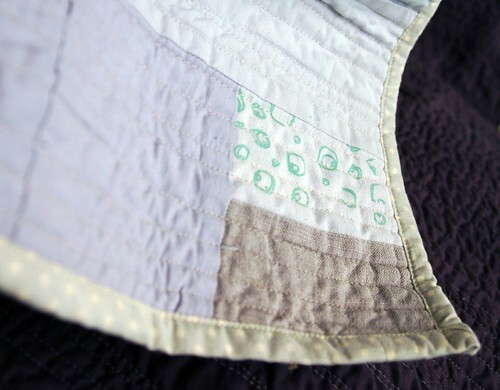 Quilting looks amazing on your quilt. Lots of lovely finished worked - brilliant work! I love that quilt, I am glad you showed the close up photo, as it gives me a better idea of what it is like. do you guys sleep when you went away, or just sew!? Wow, that reversible pinnie is gorgeous! Sewing clothes is heaps of fun. Will be checking out Ottobre myself now, thank you! Glad to see the finished reversable pinafore: that was still a WIP when I left. Lovely to meet you. Mae looks adorable in her new clothes. I bet you were glad to see each other again. it is such a good feeling to accomplish something you wanted for so long. 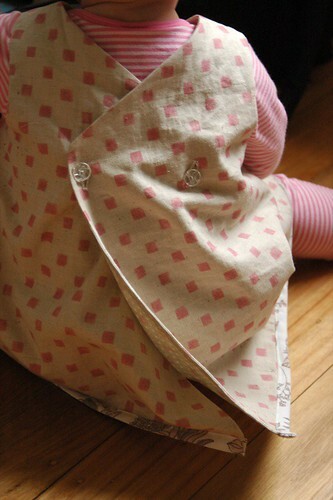 leslie - i absolutely love that reversible pinafore.. so clever! I think Sewjourn must have some magic sewing-energy thing going on, because I cannot believe how prolific everyone is when they go there! your quilt looks so beautiful! and all those clothes for Mae - also fabulous. It was lovely watching you make them! 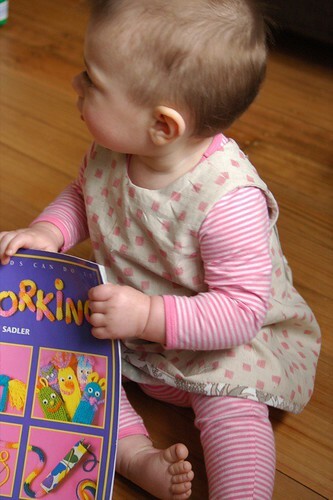 I love the pinafore! You've been busy and they're all so cute. no wonder you can't blog, after making all of that beautiful stuff you must be exhausted!! I love that quilt, can see something similar in my home . gorgeous. That Ottobre looks amazing. I might just have to try and find myself a copy. Love all the clothes you made for Mae. So cute! Love, love everything you've made and thanks for the link to ottobre. Wow! It was so lovely to get to know you!!! Your daughter looks so cute in those clothes that you made for her. I love the quilt too and it is just perfect for this cold weather we are having right now. the clothes are all so lovely. making clothes is a goal of mine too - although it is quite far off i think! but one day. the quilt is great too, i love the muted colours. Yay for you! I've been wanting to make more clothes for me and the girls - it's so good to see what you have been able to sew up for Mae. Lots of inspiration there and I can't wait to see what you've sewn up for yourself. I have heard lots of good things about Ottobre - just wondering if you subscribed or were you able to buy a copy here in Melbourne? I thought I left a comment, altho maybe it was on flickr instead now I think on it. I was saying how lovely it is to see that little top on her! Thanks for coming and helping make it so special. I love the quilt, it looks so fresh and modern! wow you were busy. i love all you sewed at the quilt is great. 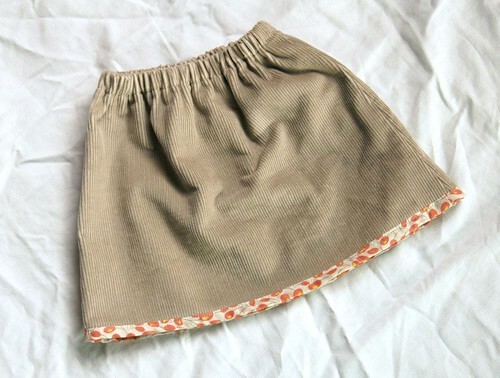 Those skirts are seriously adorable. did you do all that quilting on a regular or long-arm machine? i have a first quilt in the making and i wanna know if i am actually going to be able to quilt it! This is outrageous!!! All of these items are lovely and amazing, and of course, you do have one of the cutest little models around. It's exciting to see you enjoying making clothes. I remember my Mom always used to make me and my brothers homemade stuff (dresses, PJ's, shirts, etc.) and it's something I still consider to be very special. I still have some of those pieces, and treasure them. I'm sending you an e-mail about quilts, too, because I have wayyy too much to say here! Admirable skills, Les! that quilt is STUNNING! it's all wonderful, but i'm in love, madly, with the quilt. The clothes look beautiful, Mae is going to be a very well dressed baby. You achieved an awful lot over the weekend and I can see it is just the start of it. I seem to recall you questioning your ability to sew clothes - obviously you werre greatly mistaken as these are gorgeous! LOVE the clothes! I have also made a couple of versions of that blouse that my daughter wore a lot. 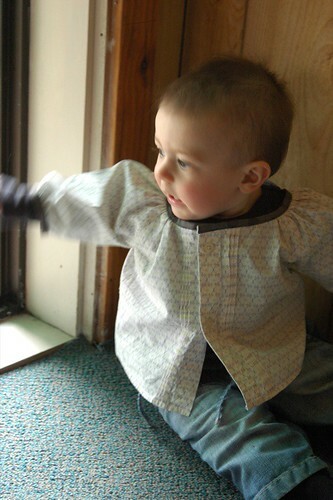 I'm a huge fan of Ottobre and making clothes for kids is so quick and there aren't fitting issues usually. Can't wait to see what else you whip up. & where the heck do you find all this time to make all this stuff!? Do you have a nanny! ?